I’ve had the pleasure this year of screening a number of selections from this year’s Tribeca Film Festival, which takes place April 15th-26th. A great documentary captures two sides of a story without appearing to have any bias. It can be difficult for a film to remain completely neutral, but knowing that it comes from a certain vantage point and that it still represents both sides fairly is even more impressive. This cleverly titled documentary follows Paul Mangwana and Douglas Mwonzora, the representatives of the president’s party and the opposition, respectively, in Zimbabwe, who were selected following the 2008 presidential election to begin work on a constitution for the country. 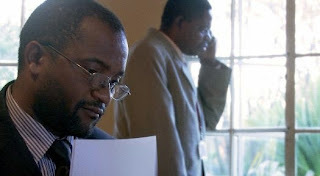 Mangwana toes the party line and gleefully expresses his intent to keep his president in power while Mwonzora protests what seems like an inability to move forward, and both men publicly champion what they believe without holding anything back. It’s a marvelous and eye-opening look at a country not known for its democratic nature, and a fascinating exposé that serves as a fair, balanced, and extremely strong nonfiction film. See it or skip it? See it. It’s both well-assembled and very educational.